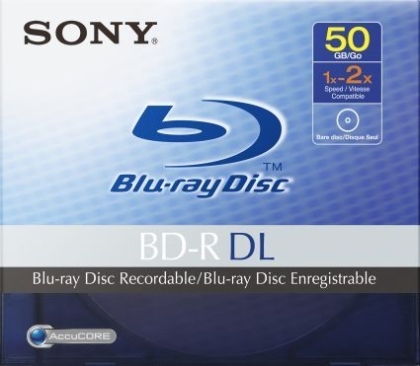 Sony has started shipping 50 GB Dual Layer Blu-ray BD-R DL discs for use with Blu-ray burners. 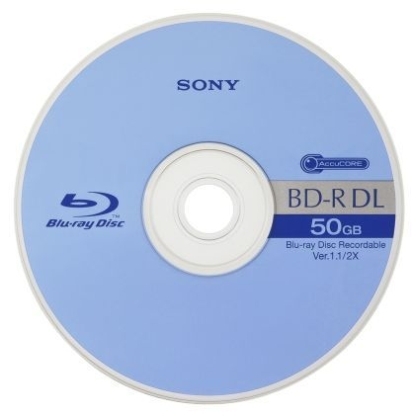 The 50 GB BD-R DL discs can be burnt at 2x speeds ( 2x = 9 mb/sec) and built with Sony�s AccuCORE technology for better data reliability. The disc’s are expected to be sold at whopping $48 (INR 2208) and blu-ray burners cost around $1000 (INR 46,000) for these prices I can buy a moderately High end Dual Core computer. Sony Electronics has begun U.S. shipments of 50GB dual layer Blu-ray Disc� recordable (write-once) media with AccuCORE� technology. The company also confirmed that it plans to start shipping 50GB dual layer rewritable BD media later this year. Lucas said that Sony�s AccuCORE technology has been re-engineered for Blu-ray Disc media, with its major benefits including scratch guard, archival reliability to prevent data/image corruption and deterioration, stable writing that reduces fluctuation as the disc spins, and temperature durability to prevent warping during severe changes in temperature and humidity. Sony�s 50GB dual layer recordable disc has a suggested retail price of around $48.